The former RR Donnelley plant in Greenfield will be home to Corvac, which makes thermoform for automotive applications and will likely provide 2oo jobs in Greenfield. An auto industry supplier is expanding to Greenfield and will bring around 200 new jobs to the former RR Donnelley facility. 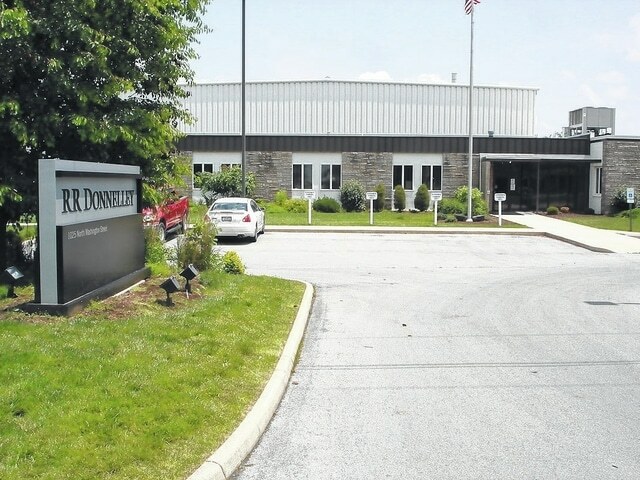 Highland County Commissioners announced Monday that Corvac Composites has reached a preliminary agreement to acquire the existing 175,000 square foot facility in Greenfield. The acquisition is subject to due diligence and anticipated to close in the third quarter of 2015, with new production slated for early 2016. The facility will continue Corvac’s expansion throughout North America, producing a variety of external automotive barrier parts for leading OEMs. In total, over $10 million in new machinery and equipment will be placed into operation at the site and, once complete, the facility is anticipated to employ over 200 people in the Greenfield area. Details on future employment opportunities will be announced at a later date. “Corvac wishes to acknowledge the efforts of JobsOhio, the Appalachian Partnership for Economic Growth (APEG), Highland County Economic Development and the Village of Greenfield. Their cooperative approach has been very important to meeting project goals and timing,” according to a press release. Commissioner Shane Wilkin said that Monday’s announcement came through a JobsOhio lead. “We probably get one or two projects a week” through JobsOhio that might be a possibility for Highland County, he said. In March, commissioners learned that Corvac was looking to expand, and local officials thought the Donnelley plant might be a good fit. Wilkin said that meetings were held, first with Corvac’s director of sales, and a week later with company executives who toured the Greenfield plant. There were a couple of times that local officials worried the project might fall through, first when a facility closer to Corvac’s current headquarters became available, and second when word spread thorugh social media that another company was preparing to hire at the Donnelley plant. The Times-Gazette ran a story in May shooting down that rumor. Wilkin praised Tara Campbell, director of Ohio Means Jobs Highland County, as well as Nicole Oberrecht, deputy clerk in the commissioners’ office, both of whom he credited for being quick to turn around numbers and stats that company executives requested throughout the process. He thanked Katy Farber with JobsOhio, as well as Cliff Rosenberger, the Ohio House speaker and state representative from the 91st District, which includes Highland County. “We’re glad to have a good partner like Cliff,” said Wilkin, who also credited State Sen. Bob Peterson, whose 17th District includes Highland County. The RR Donnelley printing facility closed about two years ago, costing about 160 jobs. Local and county officials have been attempting ever since to market the facility, which offers 175,000 square feet of space for industrial use. The anticipated new jobs would exceed the jobs lost with the Donnelley closing. Corvac will join other Greenfield companies in auto-related manufacturing. Johnson Controls manufactures seats and other products for the auto industry. C-Mold is an injection molding plant with about 85 percent of its products manufactured for Honda. Corvac Composites is “a supplier of airflow management and water-deflection systems to OEM and Tier Manufacturers,” according to the company’s website description.